An attack on the Antimasonic party, produced shortly after their September national convention in Baltimore. 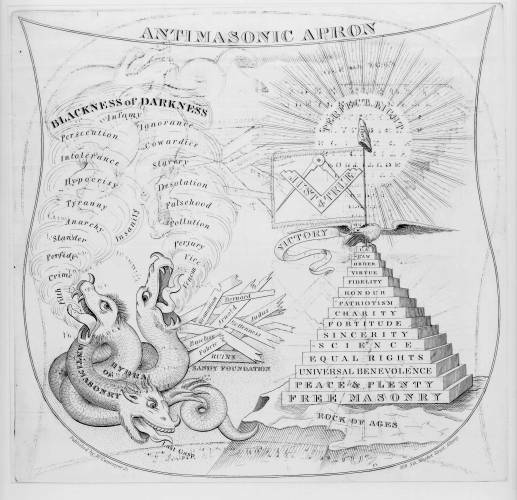 The "apron" symbolically contrasts the Masons with the Antimasons. On the right is a "Rock of Ages" on which stands a pyramid with steps labelled (from the bottom upwards): Free Masonry, Peace & Plenty, Equal Rights, Science, Sincerity, Fortitude, Charity, Patriotism, Honour, Fidelity, Virtue, Order, Law, and U.S. On the top sits an eagle with a streamer inscribed "Victory" and a staff with liberty cap and flag with the masonic device of a compass and right angle with the words "Just & True." Around the liberty cap is an aureole of "Perfect Light." Baseless Fabric, Arnold, Bernard, Stramonium, and Judas. The whole design is enclosed in an apron-shaped border.